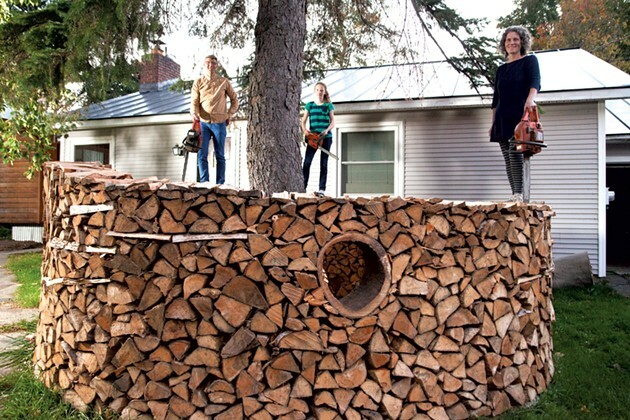 Sculptural Woodpile | Habitat | Kids VT - small people, big ideas! As a kid, Sarah Adams-Kollitz hated stacking wood, a regular chore at her home in Underhill. "I think I might have said, 'I'm never going to stack wood when I grow up,'" she says. Her family's elaborate woodpile is likely the first thing people notice when they pass her Pine Street home in Burlington's South End. Two and a half cords, perfectly interlocked, encircle the trunk of a green spruce. Four big, hollow logs perforate the wall like portholes, and thin wood strips cut across it at random intervals. At night, when the Christmas lights inside the structure are glowing, the woodpile looks lacy. It is the ultimate jigsaw puzzle — part art, part landscape, and, given that wood is the family's primary source of heat, wholly functional. "I decided if I was going to have to [stack wood], we should make it fun," says Adams-Kollitz, director of Burlington Children's Space. She collaborates on the pile with her husband, Jon, who trained as a landscape architect, and their 12-year-old daughter, Grace. Until four years ago, they had an ordinary pile stacked against the side of the garage. Then, inspired by British sculptor Andy Goldsworthy and traditional Scandinavian round woodpiles, they built their own spiral stack around the green spruce. Every year since, they've changed the design. For this year's South End Art Hop, the family added a fog machine to the yellow and white lights inside the pile. "And I'm going to classify that as a failure," Jon says, "because I think everyone in the neighborhood, and all the cars driving by, thought my woodpile and tree were on fire." The eye-catching pile gives commuters something beautiful to look at while chugging along in traffic, but by late March, it will be gone. And that's OK, the Adams-Kollitzes agree. "That's why it's so fun," Sarah says. "We'll make another one next year." 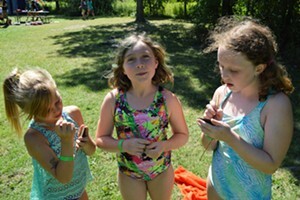 They start sketching new designs in the spring. Stacking takes about 20 person-hours. They work with the existing landscape, laying horizontal wedges to even out the ground.